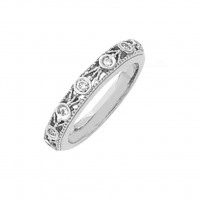 Vintage wedding rings are finely detailed works of art, often referred to as lavish or luxurious. These rings are carefully crafted to feature lacy open work, large diamonds and small accent gems or pearls. The Edwardian era wedding ring are the elegantly detailed platinum setting, the artistic use and placement of diamonds, and the feminine quality of the finished ring. These Victorian wedding ring sets have an antique look and timeless brilliance that speaks directly to the heart. One glance at these rings and you are transported to a time when men were chivalrous, women were regal and mysterious, and life was full of flowers and simple romance. Though Victorian wedding rings often featured diamonds or other stones, the main focus of the ring was on the band itself. These bands were either kept simple and highly polished or they were hand stamped with eternity designs. This collection of Victorian wedding ring sets perfectly captures the styles of the bygone era with gorgeous precious metals and exquisitely crafted details.